ABOUT BLAKE CROUCH: Blake Crouch was born in Statesville, North Carolina and graduated in 2000 with degrees in English and Creative Writing from the University of North Carolina. He has written four previous novels and a host of short stories. Two of his stories have been optioned for film adaptation. Blake currently lives in Durango, Colorado with his wife. This is his debut collaboration with his sibling. ABOUT JORDAN CROUCH: Jordan Crouch is the younger brother of Blake Crouch, Jordan attended the University of North Carolina at Wilmington and graduated in 2007 with degrees in Creative Writing and English Literature. He currently lives in Seattle, Washington. Eerie is his debut novel. On a crisp autumn evening in 1980, seven-year-old Grant Moreton and his five-year-old sister Paige were nearly killed in a mysterious accident in the Cascade Mountains that left them orphans. It's been thirty years since that night. Grant is now a detective with the Seattle Police Department and long estranged from his sister. But his investigation into the bloody past of a high-class prostitute has led right to Paige's door, and what awaits inside is beyond his wildest imagining. His only hope of survival and saving his sister will be to confront the terror that inhabits its walls, but he is completely unprepared to face the truth of what haunts his sister's brownstone. FORMAT/INFO: EERIE is 284 pages long divided over forty-four numbered chapters with an epilogue and a prologue set in October 1980. Narration is in the third-person via Grant Moreton and Sophie. EERIE is self-contained and ends on a clear note. The book also features an interview with the authors and includes a listing of Blake Crouch’s bibliography. EERIE was first published in May 2012 via the Pubit program of Barnes & Noble. 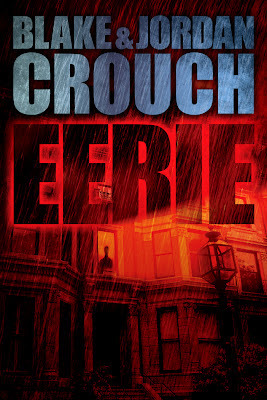 June 8, 2012 marked the overall Paperback and e-book publication of EERIE. Cover art and design provided by Jeroen ten Berge. ANALYSIS: This is the first collaboration between Blake and Jordan Crouch and based on the blurb, was a book that I was very much looking forward to. This book was part of an experiment as it was released nearly a month earlier exclusively via the Barnes and Noble PUBIT program. This was an interesting move on the author’s part as usually Blake has been known to be more affiliated with Amazon. Blake has also spoken a bit about it on Joe Konrath’s blog about why he chose Barnes & Noble this time around and what the results were like. The resulting conclusions and author talk are interesting as past blogposts on Joe’s blog have been (go read it all). The prologue of the story is set in October of 1980 wherein Grant and Paige Moreton are travelling with their father near the Cascade Mountains. Things soon take a drastically wrong turn and the story then skips thirty one years. Grant Moreton is a police officer who is searching for a missing man who is the third in line of such disappearances. After some diligent searching he turns across a surprising connection and one that goes back a long way. He manages to also locate his long disappeared sister Paige however Paige isn’t in the proper mood to communicate. Once however they do get talking is when he gets to know about the real reason behind the logic why Paige is being the way she is. Grant is soon sucked into the same quandary and he finds himself sharing a similar predicament. The Crouch brothers show themselves to be extremely proficient in setting up the stage and adding some terrific elements of horror to the story. The story quickly opens up whilst introducing the characters and then settles on to its main hook, which is figuring out what is truly happening. The main story is focused on a single place and both the protagonists are trying to find out what is happening to them. The constant sense of claustrophobia is very well ensconced within the prose as the reader is thoroughly immersed and confused, at the same time. This atmospheric horror is very reminiscent of Stephen King’s Shining and for many readers will be a solid point in their enjoyment of this tale. The biggest plus point of the tale is the overall mystery that unfolds like one of the classic Twilight zone episodes or those of a Stephen King novel wherein the story twists in an uncertain direction and the reader is thoroughly bemused as to how its all going to end. Another highlight is the prose, which seamlessly fits and is really hard to distinguish which Crouch brother has written what part and in this regard, it seems reminiscent of the other great writing duos such as Douglas Preston-Lincoln Child and Ilona Andrews. The brothers really don’t give any indication that this is their debut collaboration and thus the story is very polished. The characterization is also done well to highlight the sibling connections as well as their recent problems. The authors have also cleverly planned some misdirection in the story with a few twists so readers should be very focused while reading the book to decipher what all is truly happening. Lastly the mish-mash of several elements of this story have to be lauded, a bit of horror, a generous dash of thrills and some quirky SF touches make this story really hard to describe other than to say it's Twilight Zone-esque or even LOST-esque (to a very minor degree). The only drawback to this story is its climax or to be more specific the plot resolution. As a reader I don’t expect to have a neat and clean resolution however in many cases even rough edged climaxes can be fulfilling. This sadly is not the case; the plot resolution seems a bit choppy if that adjective can be applied. The final twist of the story while being a thoroughly good one somehow takes a bit out of the story. From a storytelling perspective it’s has to be lauded as the reader will not be expecting it at all. But for me it didn't quite gel with the earlier direction of the story. The ending is the sole drawback in this fine collaborative effort that makes it rank at a solid three and half stars of a possible five. CONCLUSION: EERIE by the Crouch brothers is a good horror story that will raise goose-bumps for most readers, tightly plotted and streamlined to give the readers a thrill ride as is the case with most Blake Crouch titles. EERIE is an excellent experiment albeit with a slightly confusing ending. Give it a read if you are a fan of horror stories with a touch of the weird. I look forward with great excitement to any future collaboration these two might write as well as their solo titles.